I am so excited that I actually finished my first painting here in Key West. I was very happy I was able to find the time and actually get it done. As time went on, it was getting daunting to think about setting everything up, but now I am looking forward to doing another soon. I am very inspired by my surroundings. This is gorgeous! My blood pressure just lowered 10 points upon gazing this peaceful and blissful scene. Ah! Gorgeous! Now that is a scene that is good for your soul. Great job on the water - the colour and reflections are perfect. As is that SKY! Okay...and then there's that lush tree mass : ) I look forward to painting #2. 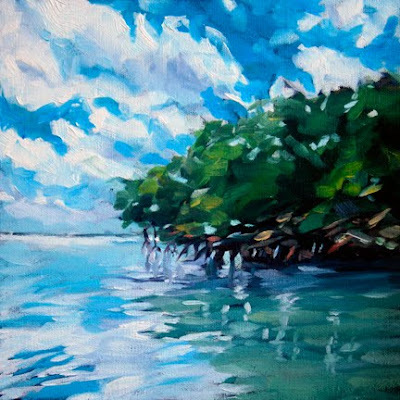 Lovely painting of the mangroves! I love the brightness and warmth! Great work! WOW!!! Your work is reflecting your state of mind. Simply stunning. I'm soooo envious, Key West has been a dream of ours. What an inspiration you are. This is just stunning! Maryann, I am really loving the direction your oil paintings are going! They have a very loose painterly feel...the cherries are wonderful too!! OMG, you are all so kind, thank you for your wonderful comments!! Thank you for my sunshine award , Stephanie! Excellent painting, Mary Anne! This painting has nice loose brush strokes, strong values, and a great atmosphere. I think being in Key West is agreeing with you. I have always wanted to visit there. It sounds like a great place and there are some great sailing regattas.